The G4 25000 Series by Haydon Kerk Motion Solutions is a 26mm stepper motor linear actuator. The G4 25000 Series linear actuators are available in three designs - captive, non-captive and external linear versions. Available in a variety of resolutions, ranging from 0.013mm to 0.102mm per step. 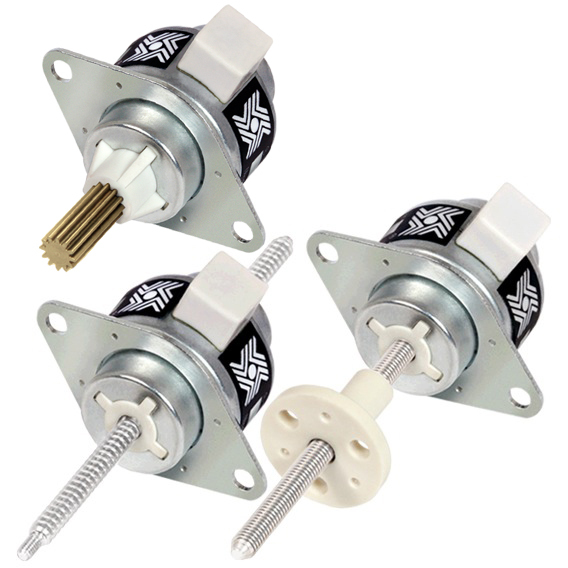 The G4 25000 Series can stack stepper motor linear actuator delivers force of up to 20 lbs (90N). Applications include medical instrumentation, office equipment, appliances, optics, machinery automation and other automated devices which require precise remote controlled linear movements. The G4 25000 Series E8T transmissive optical encoder is designed to provide the digital quadrature encoder feedback for high volume, compact space applications. Haydon offers a miniature electronic switch capable of monitoring the home position of Can-Stack and Hybrid captive linear actuators.The home position switch mounts on the rear sleeve of Haydon’s captive linear motors. This allows the user to identify start, stop or home positions of the actuator.Depending on your preference, contacts can be normally open or normally closed. The contact closure is repeatable to within one step position, identifying linear movements as low as 0.0005" (0.0013 cm) per step. Multiple contact switches are also available.The switch allows device manufacturers the ability to monitor movements more precisely for greater control and improved Q.C. When ordering motors with the home position switch, the part number should be preceded by an "S". Contact Haydon Kerk Motion Solutions for additional ordering information. Activation force of 10 oz required, therefore may not be appropriate for smaller can-stack actuators. The sensor has virtually unlimited cycle life. Special cabling and connectors can also be provided.